Tomorrow sees the release of US nonfarm payrolls, financial markets' monthly paean to the fetishization of statistical noise around a slow-moving signal. Although Macro Man has not dug terribly deeply into this, on the surface there would appear to be some downside risk to the number, given the appalling weather that the country has "enjoyed" for the last six weeks. Heck, even the diligent professionals of the Chicago construction industry have fallen behind in their renovation of Wrigley Field because of the weather. Generally speaking, however, the labor market has improved so substantially that it would normally merit a tightening of policy. 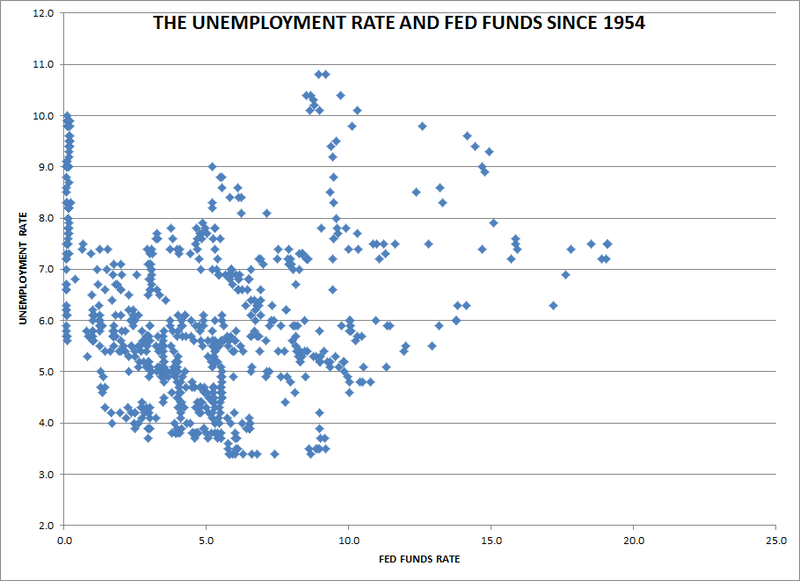 Indeed, the degree of improvement is starkly illustrated by the scatter plot below, which shows unemployment and the corresponding Fed funds rate. Other than the current ZIRP, the next-lowest level of Fed funds with unemployment at these levels was 0.8%, in the mid-1950's. Of course central banks, particularly those with dual mandates, do not make policy for unemployment alone. Inflation is obviously a clear determinant of Fed policy and preferences, especially given that it has remained persistently low in the aftermath of the crisis. Now, Macro Man has opined on this topic on a number of occasions, but hopes readers will excuse him if he addresses it once again. As you know, the Fed has chosen a reference target of 2% for the PCE price index, excluding food and energy, for inflation. This is all well and good, except that the target looks unattainable- and not just because of the lingering impact of the crisis. 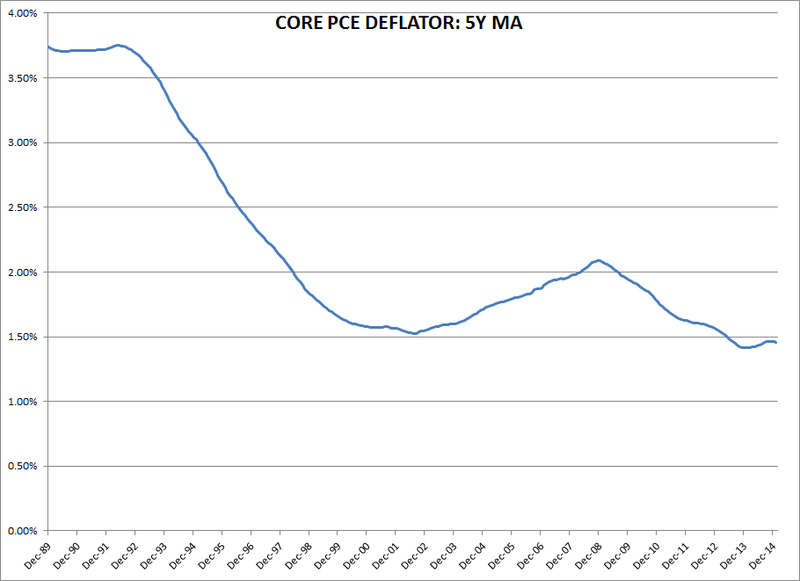 If we take a 5 year moving average of the core PCE deflator to smooth out noise, we should get a decent idea of what trend levels of inflation (as defined by the Fed) look like. And what we find is that with the exception of mid-2008 to mid-2009 (oh, the irony! ), the long-run average for the deflator has been well below 2% for nearly 20 years. Now, as your author observed a few months ago, a primary culprit for this shortfall in inflation has been the secular decline in the durable goods deflator. 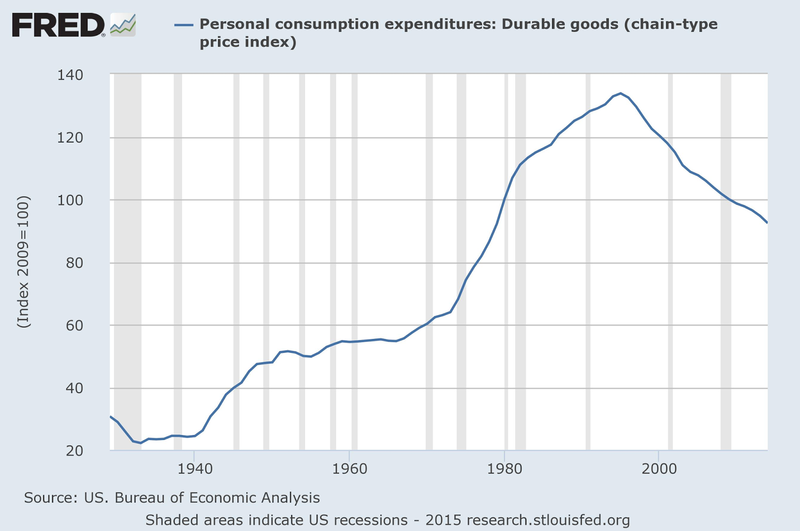 Simply put, the price of manufactured durable goods started going down 20 years ago and has kept doing so, regardless of financial conditions, the economic cycle, sunspots, or any other variable that you might choose to measure. For your convenience, the chart of the deflator index is reproduced below. Unsurprisingly, Macro Man has not changed his view that there is nothing that the Federal Reserve (or any other central bank, really) can do to offset the secular decline in durable goods prices, nor should they try- the forces driving these declines are well beyond the sphere of monetary policy. Attempting to do so, on the other hand, will impact the price of things that are responsive to central bank policy, such as many of the securities, futures, and exchange rates flickering on your screens. Recently, it occurred to Macro Man that it might be interesting to craft an alternative measure of consumer inflation, something that Janet Yellen might think of as 'TICC' inflation, e.g. 'things I can control.' Such a measure would not only strip out food and energy, the prices of which are driven by idiosyncratic factors that do not necessarily respond to monetary policy, but also of durable goods, which don't either. To calculate this 'TICC' inflation measure, Macro Man calculated traditional core PCE inflation and that for durable goods. 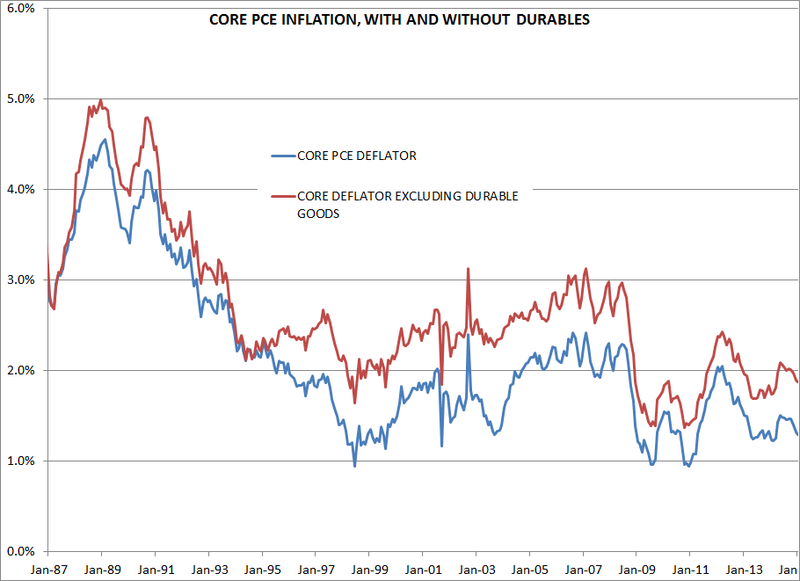 Using the monthly weight of durable goods in total core PCE expenditures, he was then able to back out a figure for core PCE inflation, ex-durables. Given that the weighting to durable goods in the overall basket is fairly modest (12% currently, down from 15% a couple of decades ago, though these were nominal rather than real figures), the overall impact to the 'controllable' inflation measure is evolutionary, not revolutionary. Nevertheless, the results are interesting, and set out below. It is interesting to note that the average 'TICC' inflation rate since the announcement of QE2 has been 1.92%- more or less bang on the Fed's ostensible target, though the current rate is very slightly lower. If you believe that the shape of the line matters more than the level, then you can still ascribe a level of deflationary concern to the Fed, insofar as both measures (core and TICC) are not hugely off of their post-crisis lows. On the other hand, if you believe the level does matter, well then there is more breathing space for the Fed between the price of things that they can influence and deflation. By the same token, this measure would have picked up that monetary conditions were too easy in the middle of the last decade in a way that core PCE did not. Naturally, none of this is to suggest that the Fed will take this type of analysis into account. One could argue, furthermore, that the fallout from the secular decline in durable goods prices (lower wages in the manufacturing and related sectors, for example) is something that the Fed should try to counteract with monetary policy, futile though it may be. Nevertheless, as the debate about lift-off intensifies over the coming weeks and months, some observers will no doubt wring their hands about the low level of inflation and claim that the Fed couldn't possibly raise rates with core PCE so low, or the economy will tip into deflation. Macro Man at least plans to keep tracking this TICC inflation so that he'll have an idea of how low it really is in things that the Fed can actually control. This will provide the opportunity for a mild short squeeze in the EUR/USD as a few Johnny come lately need to be reminded that it's not always smooth sailing to parity (and eventually lower). MM - it would be interesting to regress the durable goods multiplier vs the ratio of global trade to GDP - I doubt one gets a clean month to month relationship, but I think that's where the cause and effect lies, with a few years lag. Interestingly, and (importantly since the global trade to GDP ratio does not contain things like web traffic and services), it very clearly peaked in 2012 and has been trending down ever since - will be interesting to see if in the future your multiplier hooks up as a result. Since CNBC this morning is calling for a June raise, it is safe to assume that the majority of market forces have come to the same conclusion. Tomorrow the NFP weakness probably will only cause a short term squeeze to dollar bulls. Thanks for bringing durables into the big picture. I'd say there are multiple forces weighing down on all sorts of durable goods: e.g. the commodity glut, an ever growing labor pool for the lower education manufacturing jobs, increasing proportion of automation and other manufacturing efficiency developments, globalization etc. All of these are major forces that are pushing down unit costs and there pretty much isn't any way Fed & Co could think about countering them with. Maybe there should be a global tax on robots from the theoretical savings? Or maybe there could be a "deflation" tax that basically taxes theoretical savings when prices that would otherwise have been extrapolated with the set/wanted inflation rate, are in reality lower today than they should be. Copper costs $2.6/lb today but it should've been $3.7/lb according to the line we extrapolated with a ruler? No problem, just pay a $1.1 tax and I guarantee were going to be back on track on getting more predictable inflation in-line with expectations. Very interesting Hipper, I started writing a post on the 'deflation through disintermediation' that suggested just that. socialise the savings in effect. Deflation from supply efficiencies reduce tax income from all the retail chain and also mean that unemployed retailers need supporting by the state. Tax the difference in price drop due to disintermediation and you keep tax receipts up ( especially from those rapacious amazon offshore tax based types) and you prevent deflation. State then spends the receipts on growth ( though of course we know state is bloody useless at using tax receipts efficiently). So I guess I should finish that post ! Great post MM. I have been thinking about the same issue for a long time and thought Marc Faber had some great insights a while ago, in that inflation/deflation is never a one way street. Some prices of things are always going up more than others. Example US Healthcare vs Housing vs Durables. It is also interesting to note that CPI/PCE are made up of a basket of these series, arbitrarily weighted. For some people home prices are 50% of their spending, for other its more and others its less. But I guess in the end, the shape/path of inflation is probably roughly similar, which was well pointed out here and even on places like shadowstats. I think when everyone is paying too much attention to some indicator it probably wont end up happening. If everyone is worried about deflation, we probably wont get it. I dont know exactly how (i have some ideas as well Pol) but it seems to me an easier trap to escape than inflation. Goods deflation means my laptop costs $400 less than 10 years ago. Asset inflation means my house costs $1 million more. Healthcare also now costs as much as my mortgage. My wages have stayed constant, so I estimate I am $100k+ pa worse off. Yes deflation is a problem (NOT). Deflation is only a problem for governments & banks (who are insolvent). It's a simple excuse to monetize debt thereby directly stealing money off middle-class individuals (they call this 2% inflation targeting). The deflationary forces have been well documented here. It's also rather obvious that various gimmicks have been used for years to misreport inflation (hedonic adjustment as mentioned above and substitution). From an anectotical standpoint, few people (even the smart ones who know that they are getting a bigger bang for their bucks when buying a computer with improved performance) notice the advirtised deflation. By the way, private measures of inflation, keeping the same index as pre fudging , pin it at 6 to 7% p.a. But the real point is that all this money printing has not unleashed the expected (hyper?) inflation. The reason is simple: the banks have tightened lending standards and are sitting on mountains of excess reserves. I guess it will get interesting when the fight against sleeping money heats up and this wall of cash finally hits main street. Bingo time. Eyes down. LB leads off with 174k. >300k. Crack smokers / meth pipe tokers. 150-200k. Piss weak but "Goldilocks" number. 100-150k. "Economic Permabears" aka realists. <100k. Apocalypse at the BLS. Did you just call me a wanker LB :) ... he he he. 200k, a nice clean number! Meanwhile, a very interesting discussion above. The problem for the journey man is obviously than in a world where he can only sell his labor to make a living, he is screwed. Surely, he will be able to drive a VW Golf (2 litre engine even! ), and have an iPhone, but in the grand scheme of things, if he does not own capital, he is on the loser's list. Now, the people who OWN the technology will of course be the ultimate rent seekers, but I completely agree with LB that there will be a clash and I think access to and profiteering technology (and dare I say ownership) will need to be democratized or regulated. Maybe I am dreaming, and it will be Elysium in two decades. Another upbeat point here is that it is actually very easy these days to "create capital" and be an owner of something. Again, for most it won't be worth much, but most skills can be "capitalised" these days if you want to. Did anyone else note the irony in the ECB QE beginning on March 9? March 9 marked the low in SPX closing price, although the Bottom was reached at around 3.45 on March 6, 2009. A serious point here is that shorting SPX or being long TLT from there on was damaging to your financial health. Fast forward 6 years and replace SPX with STOXX and TLT with German 30y. Wait and see. Lumber Liquidators could become the new Manville Company. They installed asbestos products all over the US and delivered mesothelioma to hundreds of thousands of happy customers and employees before becoming a carcass for the litigation hyenas to feast on for years. It's the standard American business model. We can all have a laugh tomorrow if employment is strong in the energy and construction sectors..... perhaps unexpected growth in the weather forecaster, State Department teenage spokespeople and pothole filling sectors will drive a "boom" in US employment. You cannot trade the results of the Three Bears and Goldilocks scenario that depends on seeing the output of a periodic random number generator with some of the noisy inputs obviously invented or "seasonally adjusted"... so we won't. Great read re eu stocks re bond prices and behaviours. LB hope the Bingo settles in the "crack smokers/rose colored spectacle wearers" department. Maybe it would contribute to discharging the scare trade from UST's so we can perhaps go long TLT again, voting for the diminishing likelyhood of future Goldilock randomly generated numbers. Plus the EZ/US yield spread looks to be gapping again. Yeah, kind of agree with that, just waiting for an excuse to get long TLT but it's one of those charts where whatever you do you get battered right after you put a position on. If this one is all rosy, crack smoking or even just a bit Goldilocks-y, I think it's going to be the last one for a while. hip/lb - tht u guys would like to know the 3 of us are the only tlt bulls left on the planet at this point - presume gundlach is hiding under his table right now. the fact that such table is probably antique mahogany with japanese cherry veneer and costs $250k may be irrelevant for now. @ washedup: Yes, but the table is much more productive than previous antique mahogany tables, and thus with hedonic adjustments can be shown to cost some 15% less than an equivalent table a decade ago. Aaaaargghh MM u old dog - have to have the last word don't u.
I would have thought the deflation in durable correlates well with globalisation and particularly the high growth in China. You could say the West compensated via debt. The question for me always comes back to global rebalancing. Long term mean reversion. This cycle must deal with the debt and in doing so the rate of growth must rebalance towards the west. If that's the case I'd expect that deflator to turn around and the only question is how long does it take to happen.